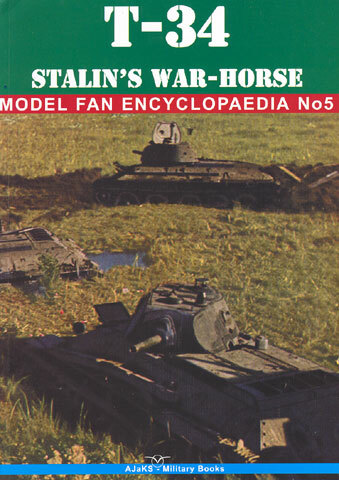 The latest in the Model Fan Encyclopaedia series, "T-34 Stalin's War Horse", is a valuable and relatively rare resource for armour modellers. The focus of the book is the T-34/76 gun tank, up to the Model 1943, up to winter 1943/44 production. The first 30 pages provides a brief introduction in both Polish and English covers the development history, combat use and camouflage. Wartime photos are used to illustrate this text. A further twelve pages evaluates currently available plastic models and accessories of the T-34/76. The best aspects of the book though, in my opinion, are the 22 pages of three-view plans; and the additional 11 pages of 3D drawings pointing out the distinguishing features of the main prototype and production versions of the T-34/76. There are no less than 33 different variants covered, with many subtle differences in turrets, hulls, hatches, fittings, wheels tracks and more! Nine vehicles are illustrated in four-view colour illustrations to also depict the variation in camouflage and markings. I own a few Russian-language publications that describe many of these variants, but it is luxurious to have access to such concise yet detailed coverage of the subject with the added bonus of English text. The format is also ideal for modellers. Although at 84 pages the term "encyclopaedia" is a bit of an overstatement, this book is a succinct and essential work for any modeller with an interest in the ubiquitous T-34. Thanks to AJaKS for the review sample.